A while back, I did a random comment yarn giveaway. Anyone who knows me understands how happy-making it is for me to give the gift of yarn. There is never any expectation of reciprocity. Imagine my surprise when I returned from the auto shop to discover that what I’d given had come back to me. Behold my gorgeous new yarn, courtesy of Jen at Knitting Like Crazy. She even named the colorway after my nom de plume, “La Cabeza Love,” my first ever eponymous yarn. I tried really hard to capture the soft steel-gray blue shade, but the daylight is pretty meager at the moment. It’s always a pleasure to open the mailbox and find something like this. Makes the bills that were tucked underneath seem not quite so important for the moment. 7 comments to We are everywhere! heheh – I’m known as the “sock knitting lady” at my car repair shop. 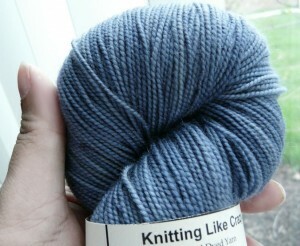 And I LOVE your yarn…it’s sooooo pretty – no one deserves a colorway named for them more than you do! What a sweet and thoughtful surprise! Out here, if I take my knitting (usually a sock or scarf) to knit while waiting at the doctor or dentist, I am treated weirdly. There are a lot of knitters/crocheters in California, but here in the Central Valley, we can be eyed askance by the general public. 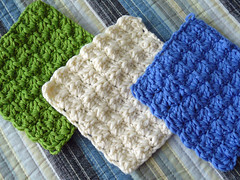 I always knit or crochet when I get an oil change – in fact, I’m probably the only customer who doesn’t mind if there’s a long wait or a lot of cars head of me, because it’s just more time to relax and knit! Congrats on the lovely, lovely colorway.